WE INVESTIGATED PEOPLES’ ABILITY TO ADAPT TO THE fluctuating tempi of music performance. In Experiment 1, four pieces from different musical styles were chosen, and performances were recorded from a skilled pianist who was instructed to play with natural expression. 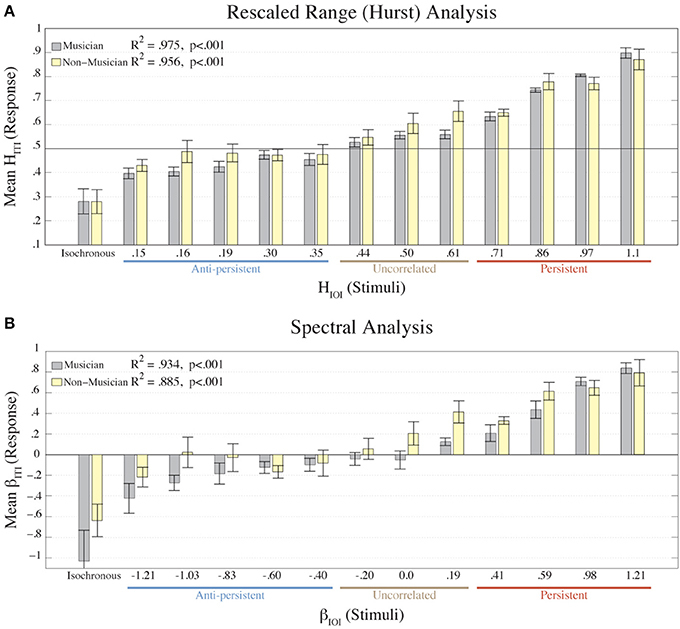 Spectral and rescaled range analyses on interbeat interval time-series revealed long-range (1/f type) serial correlations and fractal scaling in each piece. Stimuli for Experiment 2 included two of the performances from Experiment 1, with mechanical versions serving as controls. Participants tapped the beat at ¼- and ⅛-note metrical levels, successfully adapting to large tempo fluctuations in both performances. Participants predicted the structured tempo fluctuations, with superior performance at the ¼-note level. Thus, listeners may exploit long-range correlations and fractal scaling to predict tempo changes in music. Fractal Structure Enables Temporal Prediction in Music. 1/f serial correlations and statistical self-similarity (fractal structure) have been measured in various dimensions of musical compositions. Musical performances also display 1/f properties in expressive tempo fluctuations, and listeners predict tempo changes when synchronizing. Here the authors show that the 1/f structure is sufficient for listeners to predict the onset times of upcoming musical events. These results reveal what information listeners use to anticipate events in complex, non-isochronous acoustic rhythms, and this will entail innovative models of temporal synchronization. This finding could improve therapies for Parkinson's and related disorders and inform deeper understanding of how endogenous neural rhythms anticipate events in complex, temporally structured communication signals. Interactive generative musical performance provides a suitable model for communication because, like natural linguistic discourse, it involves an exchange of ideas that is unpredictable, collaborative, and emergent. Here we show that interactive improvisation between two musicians is characterized by activation of perisylvian language areas linked to processing of syntactic elements in music, including inferior frontal gyrus and posterior superior temporal gyrus, and deactivation of angular gyrus and supramarginal gyrus, brain structures directly implicated in semantic processing of language. These findings support the hypothesis that musical discourse engages language areas of the brain specialized for processing of syntax but in a manner that is not contingent upon semantic processing. Therefore, we argue that neural regions for syntactic processing are not domain-specific for language but instead may be domain-general for communication. Fractal structure is a ubiquitous property found in nature and biology, and has been observed in processes at different levels of organization, including rhythmic behavior and musical structure. A temporal process is characterized as fractal when serial long-term correlations and statistical self-similarity (scaling) are present. 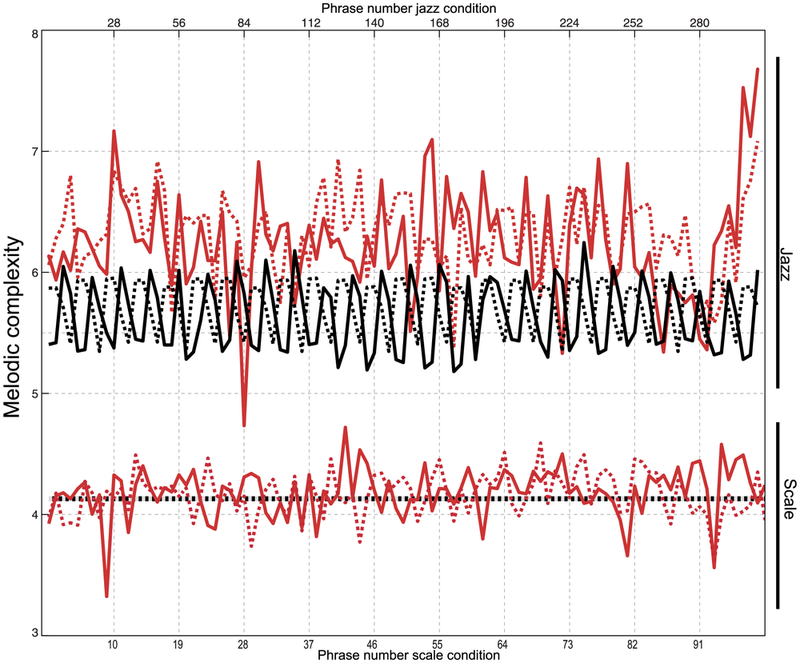 Previous studies of sensorimotor synchronization using isochronous (non-fractal) stimuli show that participants' errors exhibit persistent structure (positive long-term correlations), while their inter-tap intervals (ITIs) exhibit anti-persistent structure (negative long-term correlations). Auditory-motor synchronization has not been investigated with anti-persistent stimuli. In the current study, we systematically investigated whether the fractal structure of auditory rhythms was reflected in the responses of participants who were asked to coordinate their taps with each event. We asked musicians and non-musicians to tap with 12 different rhythms that ranged from anti-persistent to persistent. The scaling exponents of the ITIs were strongly correlated with the scaling exponents of the stimuli, showing that the long-term structure of the participants' taps scaled with the long-term structure of the stimuli. Surprisingly, the performance of the musicians was not significantly better than that of the non-musicians. Our results imply that humans are able to readily adapt (rather than simply react) to the overall statistical structure of temporally fluctuating stimuli, regardless of musical skill. SK Rankin, CJ Limb (2014). Auditory-motor synchronization with temporally fluctuating sequences is dependent on fractal structure but not musical expertise. Front. Psychol., 03 September 2014.